nothing like I expected, and yet it was everything I never knew I was looking for in a kids devotion book…. This devotion book is ingenious! The new book Dinosaur Devotions (75 Dino Discoveries, Bible Truths, Fun Facts, and More!) by Michelle Medlock Adams was nothing like I expected, and yet it was everything I never knew I was looking for in a kids devotion book. I had no idea how they were going to combine dinosaur facts with Bible stories. I was intrigued, but doubtful this would be something I’d enjoy. But kudos to Adams, she definitely proved me wrong. This devotion book is ingenious! It’s not actually filled with Bible stories like what I’m used to reading with my kids before bed. Instead, it reads a lot more like an adult devotional, pairing scripture with situations we all face in life and practical life lessons. And yes, the dinosaurs fit in very well! If you have a dinosaur lover in your household, or even if you’re just looking for something a little different for your kid’s devotion time, Dinosaur Devotions is a great new option. Still not sure how it all works together? Read on. 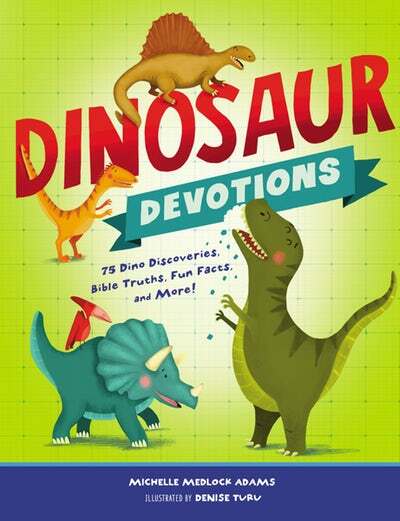 Dinosaur Devotions has 75 different devotions, all featuring a different dinosaur. I’m not exactly well-versed in my dinosaur facts, so this was pretty interesting stuff for me. Each devotion is two pages long, with various fun facts, photos, a Bible verse, and activities filling the pages along with the actual devotional writing. Let’s break down one of the devotions so you get an idea of how this book works. The devotion on the Barosaurus is called “God can use it.” It talks about how the Barosaurus was a plant eating dinosaur with a very long neck to reach trees without even having to move. In the process of eating leaves and twigs, it also swallowed some rocks. You may think this is a bad thing, but it was actually helpful for the Barosaurus. Since this dinosaur swallowed its food whole without even chewing, the rocks helped to break down the food so it could be properly digested. Pretty cool, right? 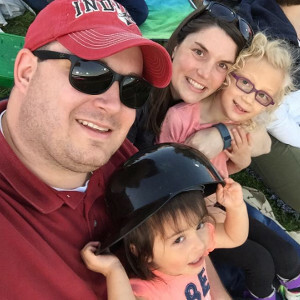 The devotion goes on to talk about how in our lives, something that seems bad at first can actually turn out to be good, or beneficial to our lives. Like not being in a friends class is sad, but it then allows us to make new friends. The Bible verse, or “Bible Excavation” as the book calls it, is Romans 8:28 – “We know that in all things God works for the good of those who love him, who have been called according to his purpose.” The devotion talks a little more about finding the positives in a bad situation, and about asking God to use the “rocks” in our lives for good. There’s also a Digging Deeper activity and Jurassic Journaling activity if you want your kids go a little further with their devotion. And that, my friends, is how dinosaurs and the Bible can go hand in hand. Pretty cool stuff in my opinion! With 75 different devotions, this book gives you almost three months’ worth of new material for Bible story time! And it’s all stuff that is new and fun to learn about, instead of just reading a different version of Daniel in the Lion’s Den multiple times through the months. Not only is there a lot of really cool dinosaur information, there’s a lot of Biblical truth to get our kids through the day. I think it’s incredibly important to not only teach our kids Bible stories, but to help them apply the Bible to their daily lives. Dinosaur Devotions does exactly that! Take for example the Leaellynasaura. It used its very long tail to wrap up in to keep warm during the freezing conditions it sometimes lived in. Just like a security blanket that makes us feel warm and safe, this dinosaur had its tail for that. God’s love wraps around us just like the dinosaurs tail. He will never leave us, and He will be our comfort. It really is remarkable how well the author put together the fun dinosaur facts and important Biblical truths. And I love that this book is different from anything else I’ve seen out there for kids. I love that it teaches practical life lessons from the Bible, but in a really entertaining, novel way. While I think mid-upper elementary aged kids will get the most benefit from this devotion book, even my 4 year old enjoyed it. So if you’re looking for a fun new idea for your dinosaur lover, or really for any kid in your life, check out Dinosaur Devotions. I can almost guarantee it will be the most unique devotion book you’ll own, but I’ll bet it will also be your new favorite.